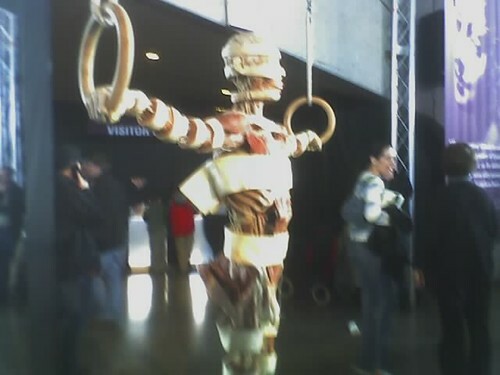 Yesterday, a few friends and I went to Toronto to see the Ontario Science Centre’s Body Worlds 2 exhibit. 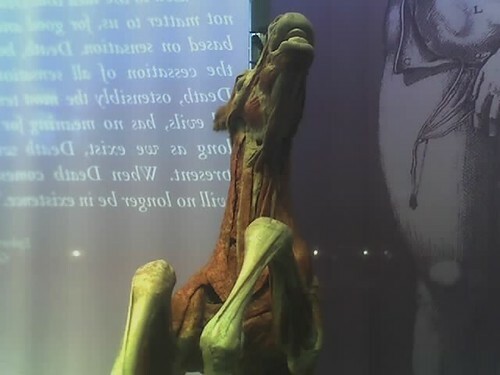 This exhibit consists of real dead bodies and organs, preserved by replacing fluids and fat with plastic. It’s partly educational, but mostly artistic. I was surprised at how close you could get to the bodies; they are not behind glass, so you can get right up to them. 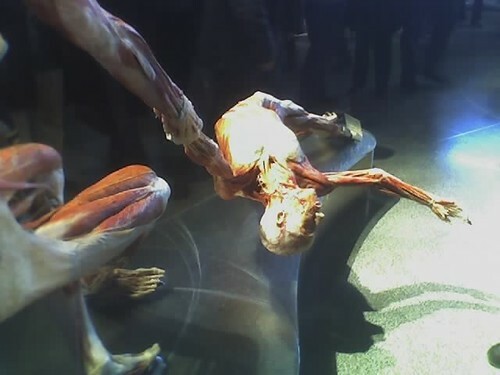 It was extremely interesting to see the insides of the human body…a place that most people will never see except in pictures. 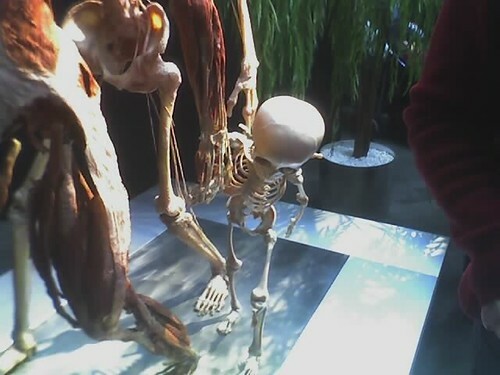 Here are two “plastinates” figure skating. They were in all sorts of poses, to illustrate different body parts and keep things interesting. This is the ring man. He’s on the rings, and his flesh is cut into rings! Get it? Not all of the bodies were human. Here’s a dead horsie! Anyway, I recommend that anyone who can go see this thing do so ASAP. It’s a once in a lifetime opportunity, and good practice for the upcoming zombie apocalypse. I have a reading problem. It’s not that I’m illiterate (even though I just had to look up how to spell illiterate), it’s that I have trouble finishing books. Whenever I get a new book, I want to start reading it right away. Therefore, all the books I’m currently reading start seeming like a chore to read; just something to get over with so I can start the new book. Usually I give in and start the new book before finishing the old one, so I end up with 20 half-read books lying around. So it is a big accomplishment for me to have finished reading the book “Blink” by Malcolm Gladwell. I’ll start reviewing books here, so I have a nice record of the books I’ve finished. Maybe it’ll motivate me to finish them. 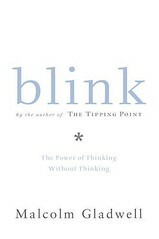 Blink is about what Gladwell calls “thin-slicing”: making quick decisions based on very little information (i.e. a “thin slice” of information). He goes through numerous examples of this process in a variety of contexts, such as military operations and the recognition of facial expressions. The book deals mainly with anecdotal accounts, which makes it an easy and entertaining read. Psychological research is not described in great detail, but the quick and casual descriptions are a nice change from the detailed procedures and statistics I’m used to reading. Gladwell offers a glimpse into areas many people never think about, such as professional food tasting, which is fascinating. It was also kinda cool for me to see Keith Payne mentioned…he gave a great talk at UWO recently. However, I have several problems with the book. It reads more like a collection of short stories than a cohesive essay. It is sometimes unclear how each chapter relates to the big picture, and some of his points seem to contradict other points. I also noticed a few obvious errors which indicate sloppiness. For example, Limp Bizkit is two words. It’s not “Limpbizkit”. My biggest problem, though, is that Gladwell is making up a new term (thin slicing) for a concept that already has too many words to describe it. My favourite term is intuition (since that’s what I’m studying myself), but it also goes by insight, implicit learning, automatic thought, etc. These are terms only briefly mentioned in the book, even though he is obviously talking about them. It is as if he is trying to cover up the fact that his ideas are nothing new. In fact, I found one of his specific examples (about a firefighter getting a bad feeling about a building before it collapsed) in a book about intuition. Intuition is already a confusing term, and calling it by other names will just confuse it even more. Still, I would recommend Blink to both psycholgists and the general reader. It’s a fun read, even though it may not be as deep or insightful as geeks like me would like. Also, I’m glad to see this topic getting mainstream attention, because it probably means the government will give me lots of money to do research on it. Mmm, money.